Inspired by the avant-garde photographic journal published by Alfred Stieglitz, the exhibition ‘Camera Work’ presents a multicultural approach to conceptual photography in the work of ten post-graduate students from the LCC at UAL. 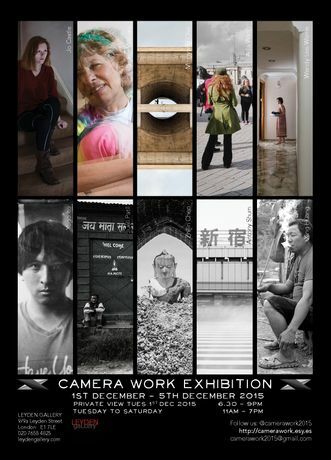 Camera Work is a show of ten post-graduate students from the London College of Communication at UAL. The images represent a multicultural approach to conceptual photography in an engaging mix ranging from sensitive documentary exploration of social and personal issues to carefully crafted architectural images. The collection of photographs spring from highly creative minds engaged in the research and theory of photography. The title Camera Work, was inspired by the avant-garde photographic journal published by Alfred Stieglitz. It pioneered progressive photographic imagery and ideas and brought them to their ultimate art form. Zhilin Chen uses traditional processing methods to develop his images. He used large format cameras to record temples in China and Southeast Asia, which have been abandoned by humans and overtaken by nature. Antony K. H. Shum focuses on cityscapes and environmental photography, his goal is to bring photography poetic-meaning, providing further dimensions beyond the visual for audiences to consider. Jueli Patil takes her inspiration from the people from Nepal. Through her lens she captures the transition from destruction to the recreation of a country after earthquakes this year. Wendy Lee-Warne is a photographic artist who was formally trained in architecture. Her project, A Woman's Fate, which started autobiographically, is the beginning of her photographic journey exploring female identity. Joanna Castle works with staged scenes on location.She is interested in particular issues of social equality and how the rapid changes in technology affect our lives and human interactions. Xing Huang was trained as an oil painter who is now focusing on documentary and commercial photography. He aims to record the perfect moment using a combination of his painting and photographic skills. Yugo Ito attempts to establish and capture a connection with the physical world in the belief that what is being perceived by the eye is a result of elementary particles of light touching an object. Camille Valbusa combines her work across documentary and fine arts photography, revealing her own particular way to see the world. Ming Yang Chai takes us to Le Corbusier’s Capitol Complex in Chandigarh, India. In his work we can see what 60 years of wear and tear did to the buildings. Aijia Wang’s roots are in documentary and landscape photography. She travels the world in order to tell stories through photographs.